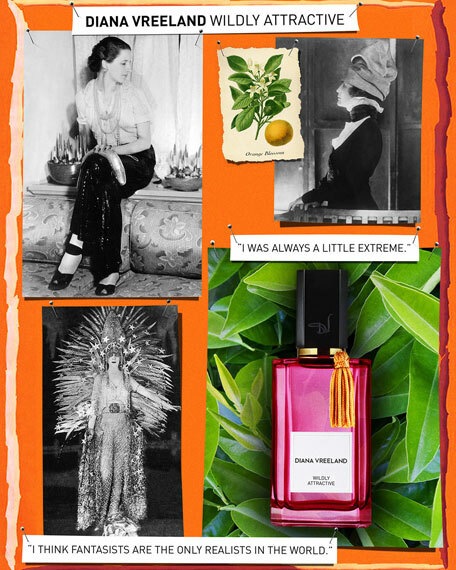 Designed by master perfumer Carlos Benaim, Wildly Attractive was inspired by Diana Vreeland's belief that it is our imperfections that make us beautiful! As Editor in Chief of Vogue, she redefined the look of models and the concept of photo shoot location. She introduced the likes of Penelope Tree, Lauren Hutton, Anjelica Huston and Barbara Streisand. She championed women who were complete originals and took photo shoots out of studios and sent the crews to Japan, Turkey and Athens. In the same manner, Wildly Attractive takes an orange blossom scent on an exotic voyage. Wildly Attractive opens with alluring orange blossom, petit-grain and a sparkle of mandarin. In an enigmatic, enthralling play between lightness and darkness neroli and jasmine sambac give way to a finish of musk and the finest natural oud transporting the wearer on a dazzling and mysterious journey.